This is the story about the Saturday night back in mid-December when my brother shut down Mission Chinese Food to celebrate his 35th birthday. After pre-gaming at Katz’s Deli and sneaking in some sweets at Dessert Club Chikalicious, The Astronomer and I made our way down to the Lower East Side for a feast like no other. 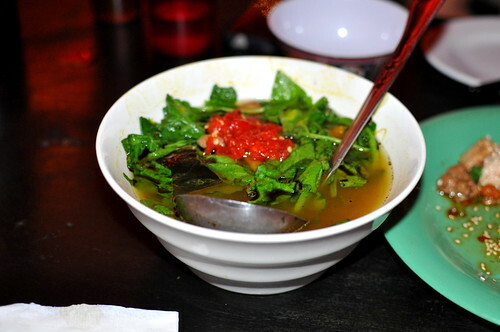 We’re certainly no strangers to multi-course Chinese banquets, but this one was wildly different with twelve tongue-numbing Sichuan delights masterminded by Chef Danny Bowien. 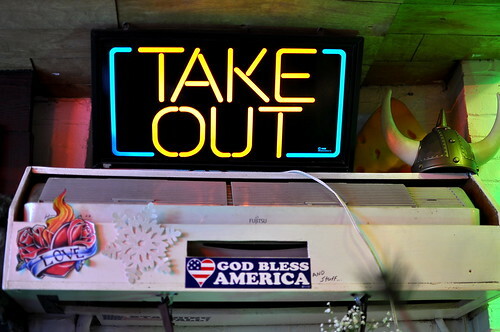 Mission Chinese Food arrived in New York City last summer from the shores of San Francisco. 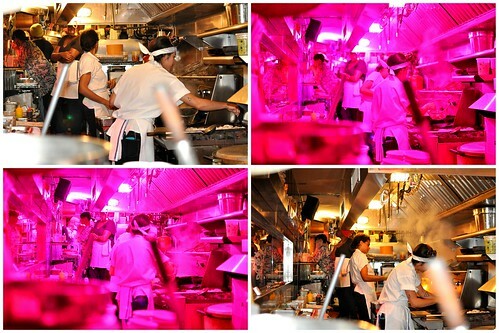 The subterranean restaurant, which is dimly lit in a pinkish hue and seats just three dozen diners, serves “whimsical Chinese” prepared by a Korean-born chef reared in Oklahoma City. The menu was curated beforehand by my bro and his lovely wife, so all that was left to do was to sit back, sip a cocktail, and settle in for the fireworks. 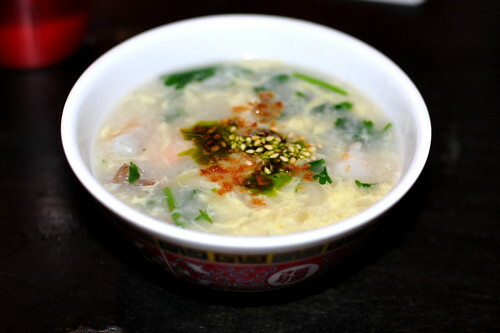 Dinner officially began with an egg flower soup that was light, mellow, and chock full of wispy egg strands. 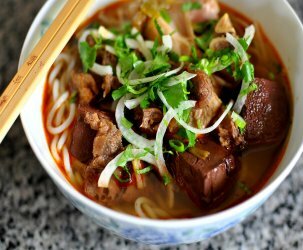 Cousin Jackie remarked that it reminded her of the seafood soup that our family digs into every Thanksgiving and Christmas. Things got a little tingly with the fourth course: “Tingly Smoked Chicken.” The tender, smokey, and boneless chicken bites soaked up the chili oil, Sichuan pepper, and black vinegar like a charm. Sesame seeds and peanuts added some crunch. The fifth course was the most virtuous of the meal: “Braised Pea Greens” in a pumpkin broth with Old Bay seasoning and boiled peanuts. It was tough for these mild mannered vegetables to compete with the bounteous spread, but I managed to make some room. The Astronomer’s favorite course of the evening was the neatly pleated “Lamb Dumplings in Red Oil,” which took a lot of sweet talking from my sis-in-law to get on the menu due to the intensive labor involved. 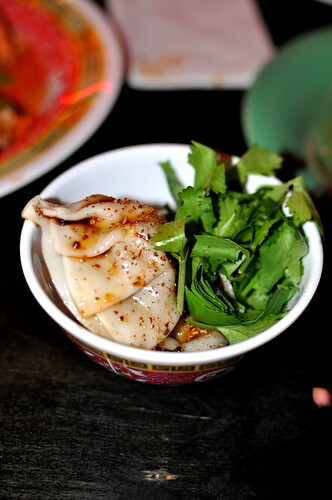 The filling was fabulously juicy, while the chili oil desensitized our tongues for a solid minute. The “Fish Fragrant Eggplant” was the next to arrive. 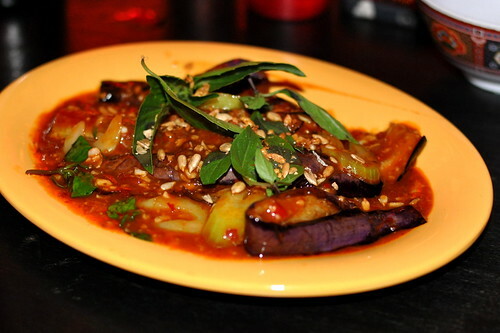 The silky eggplant spears mingled with snappy celery, sunflower seeds, fresh basil, and fried garlic in a fiery sauce. 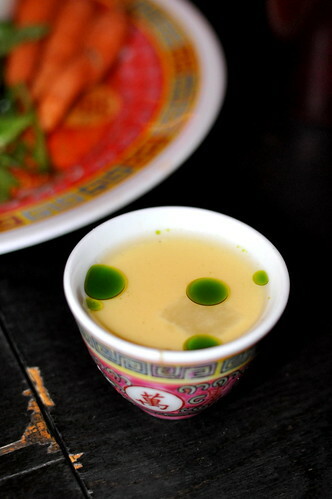 This saucy number was unstoppable spooned atop steamed white rice. 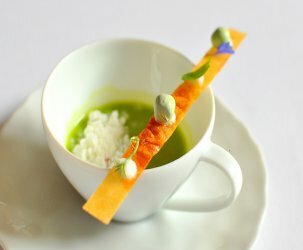 The “Broccoli Beef Brisket,” a play on the Chinese-American classic beef with broccoli, was a meaty powerhouse. 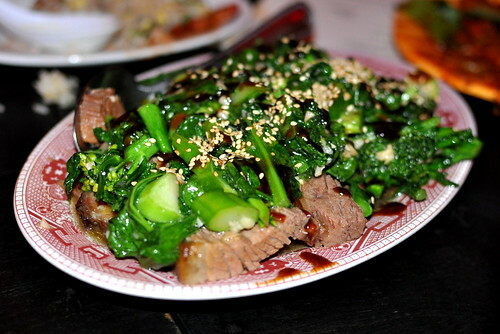 The tender slices of braised beef came topped with Chinese broccoli and drizzled with smoked oyster sauce. 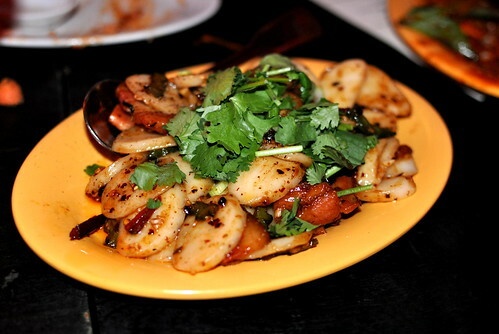 My favorite course was the “Thrice Cooked Bacon,” because I find Shanghainese rice cakes and preserved pork simply irresistible. 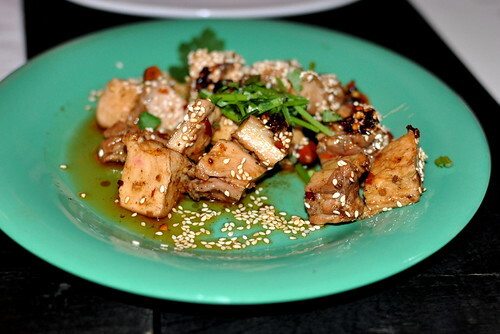 The ovular rice cakes were characteristically chewy and stir-fried in plenty of Sichuan chili oil along with tofu skin and bitter melon. 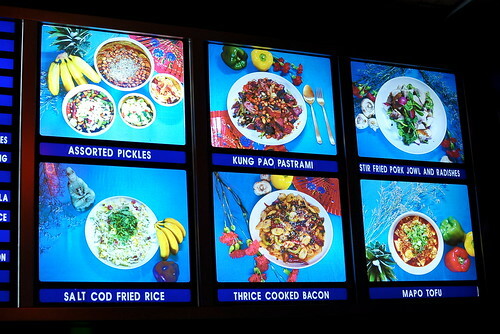 A Chinese feast isn’t complete without a fried rice course. 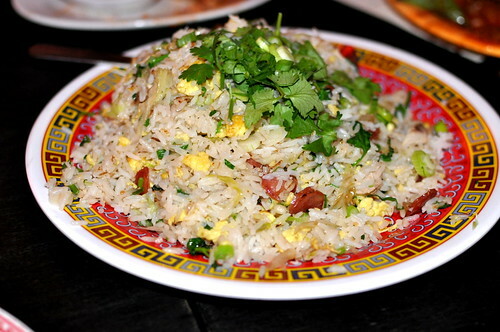 Here, the tender grains of jasmine rice were wok’d to perfection with salt cod, slow-cooked mackerel, Chinese sausage, and scrambled eggs. 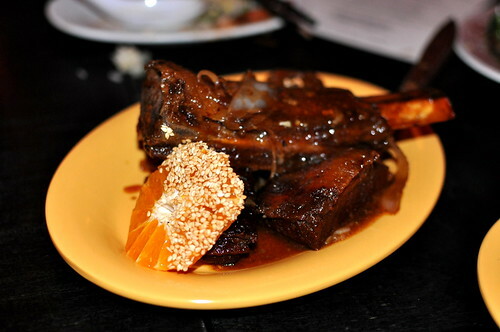 The grand finale was the “Veal Breast A La Orange.” The meat’s sticky sweet glaze, a mash up of mandarins, sesame, and burnt Kaffir lime leaves, was well-balanced, legitimately citrusy, and finger-lickin’ good. Our entire table gnawed the bones clean even though we were stuffed to the gills. 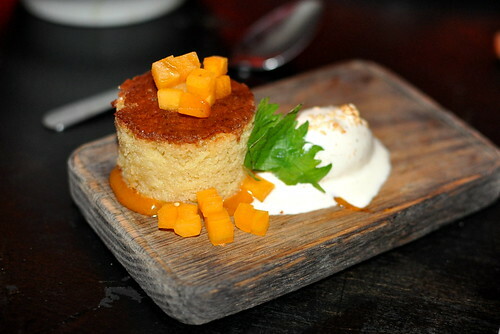 And finally, a fluffy “Chinese Almond Cookie Cake” served with persimmons and sesame ice cream. It was impossible not to enjoy myself this evening—the room was full of familiar faces, the collective spirits were high, and the food was terrific from start to finish. 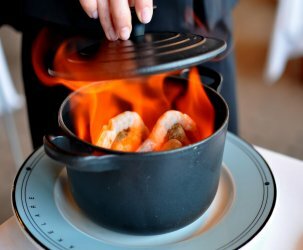 With each course, Chef Bowien really captured the excitement and flavors that make regional Chinese cuisine so incredible. 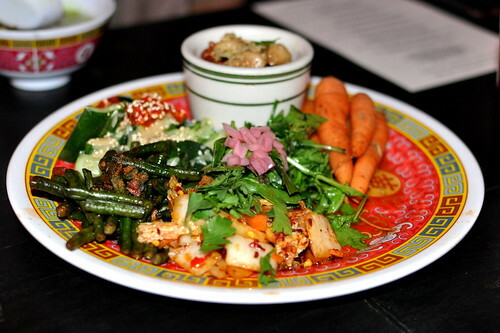 Mission Chinese Food has done a valiant job bringing delicacies like rice cakes and Sichuan peppercorns to a hip, cool, and mainstream audience, and for that, I tip my hat. Everything sounds fantastic! I wanted to go when I was in San Francisco, but my sister didn’t want to wait in line. Boo. Just went in SF when I was at the Fancy Food Show! So good! Now that’s the way to celebrate a birthday! Awesome! !